For the 12th consecutive year, skipper Peter Barbour and Christmas boat D25 earns a first place victory in the 2015 Newport Beach Christmas Boat Parade. The décor at D25 for 2015 features a Christmas dolphin guiding a sleigh filled with gifts and pulled by a giant seahorse. In 2009, D25 demonstrated one of the most complex designs in the series. The entry included a matrix of colored ornaments, made with hundreds of individual bulbs. The matrix enabled the computer controller to make an amazing array of “bouncing ball” images that danced across a black background. 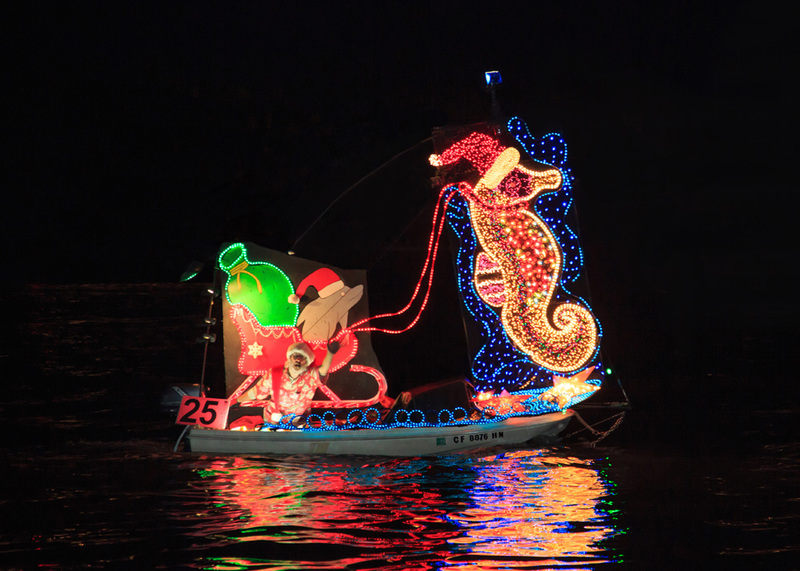 D25 for 2008 was inspired by the origins of the Newport Beach Christmas Boat Parade on July 4, 1908, when John Scarpa, a gondolier, led a parade with eight fellow small boat operators. Theme: Surf’s Up – Light Wave: Surf’s Up on D25 features over 5,025 lights illuminating a holiday surfer’s dream. In the middle of November, Original Productions, Inc. asked Peter to appear on a documentary on intense holiday decorations for TLC: The Learning Channel. The episode “More Crazy Christmas Lights” premiered on December 8, 2007. Theme: Classic Christmas. D25’s second design was inspired by a classic Christmas living room scene. A large decorated Christmas tree with presents stacked below the bows and a star atop, red brick fireplace with a roaring fire and stockings hung below a mantle. Theme: Santa’s Sailing Sled. D25’s debut design was inspired by the idea of Santa’s sailing sled being borrowed by a mischievous elf. October 3 and 4: Maker Faire® San Diego! Maker Faire San Diego is October 3 and 4, 2015, from 10 AM to 6 PM at Balboa Park. Our “Not Your Grandpa’s Ham Radio” theme will feature some new projects as well as some of the old, but popular demonstrations from previous Maker Faire events. Pictured below is a project under construction, I hope to have it completed for this event. 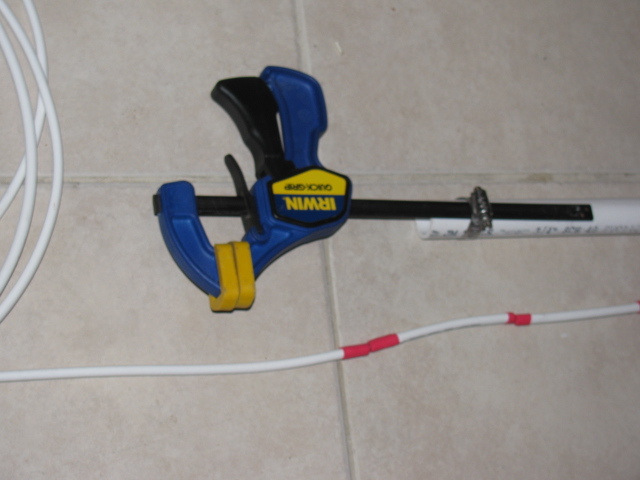 It is a homemade 1090 MHz collinear (vertical) antenna that will be part of an air traffic control monitoring station using a software defined radio (SDR). 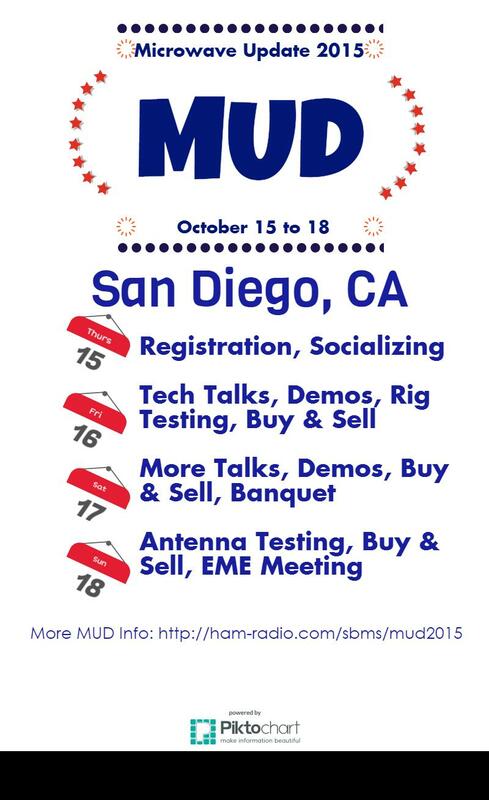 October 15 to 18: Microwave Update (MUD)! Microwave Update, or MUD, is a yearly technical conference for amateur radio experimenters making, modifying, hacking, building, testing and using the 1,000 MHz and up radio bands. 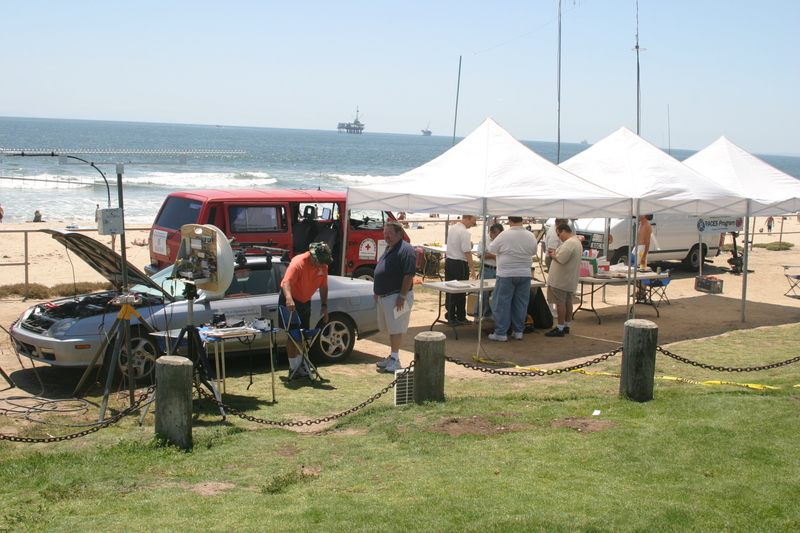 Participants from all over the world gather at these events to share information about operating techniques, radio propagation and radio station equipment. 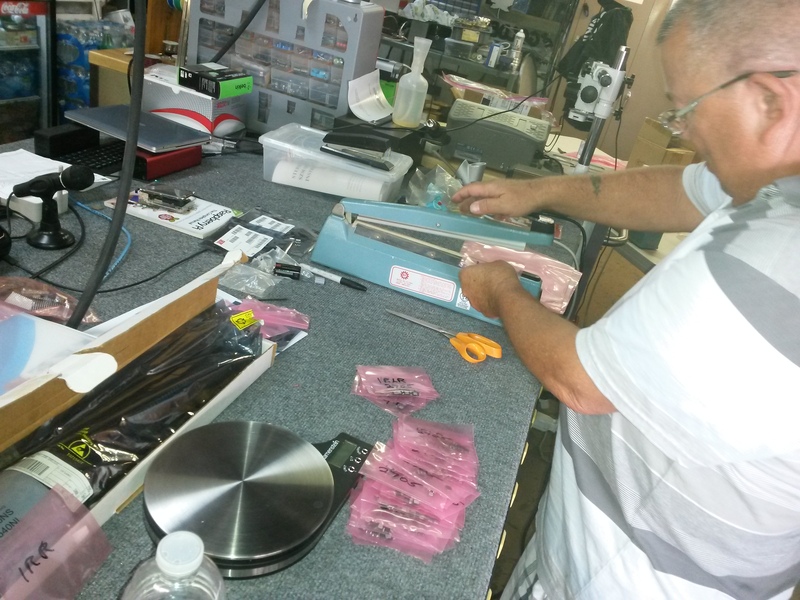 One aspect of this event is the buying, selling and trading of surplus parts and assemblies for these frequency bands, since some items may be difficult to procure in some areas. But perhaps the best thing about MUD is socializing and making new friends from all over the world to discuss common interests and goals. Preparations for the San Diego MUD are still under way. 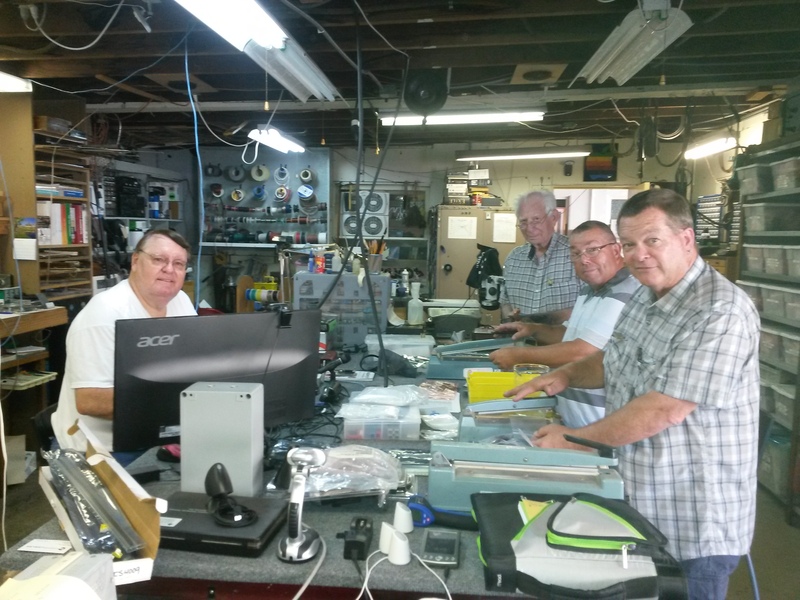 Last weekend, a few San Bernardino Microwave Society (SBMS) members gathered at Dave’s lab to sort and package some prize and give-away items for the event. Left to right: Dave WA6CGR, Rein W6SZ, Pat N6RMJ and Jim KK6MXP sorting and packing some microwave frequency prizes and give-ways. I hope to see you at any or both of these events! UPDATE: Classroom is now Children’s Building, Room “Extreme” but is subject to change. Check the following LinkedIn Groups for last minute changes: Above The Rim Executive Career Management and Saddleback Career Coaching & Counseling Ministry. Every Thursday night, from 7 pm to 9 pm Pacific time (except major US holidays): Free LinkedIn Workshop in Lake Forest, CA and worldwide (online). Learn the the best practices, etiquette and strategies to optimize your profile to get more visibility. These days, what you know is not enough. Who you know no longer applies. It is now Who Knows You. More information on the career workshops. If you are out of the Orange County, CA area, send an e-mail message to me and I will send connection details. 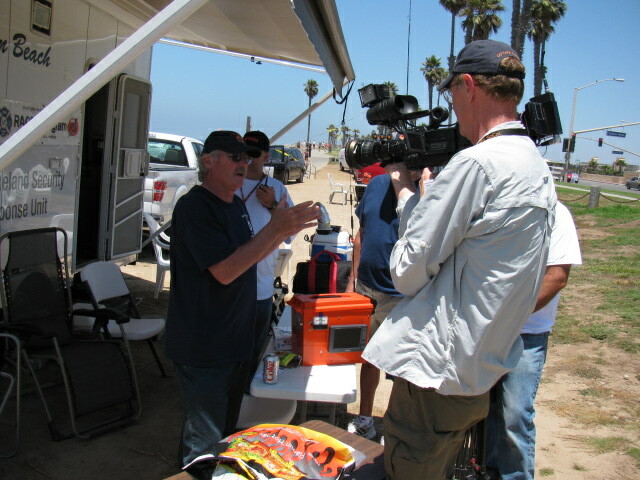 Who: Huntington Beach Radio Amateur Civil Emergency Service (RACES) team will demonstrate and practice their emergency radio communications skills in a nation-wide drill called “Field Day.” RACES (pronounced “RAY-sees”), is a program endorsed by the Federal Emergency Management Agency (FEMA) and the Federal Communications Commission (FCC Part 97, Section 407), that uses trained amateur radio operators (Hams) during emergencies. Administered by the Fire Department, RACES members use their personal equipment and skills, and volunteer their time to provide this service at no cost to the City of Huntington Beach. Where: PCH and Goldenwest on the bluffs. 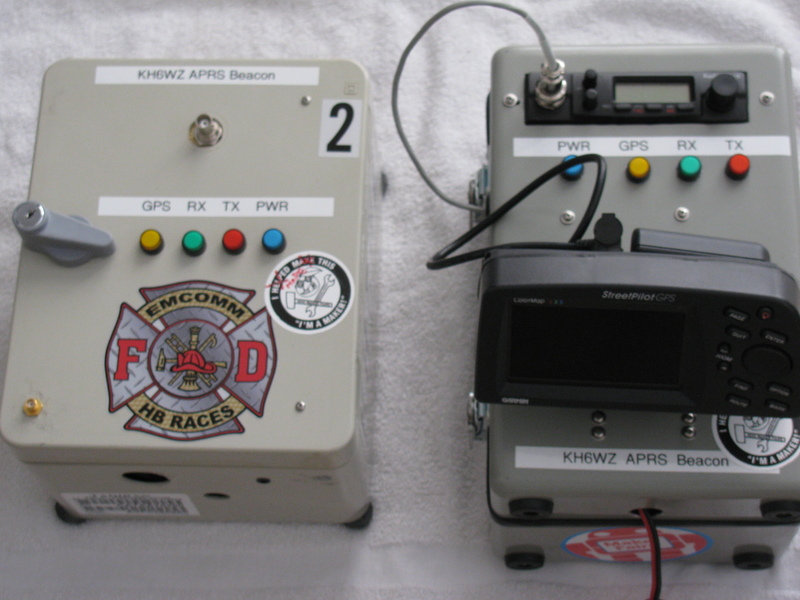 What: During Field Day, amateur radio (HAM) operators from the US and Canada will practice their emergency communications skills over a 24 hour period with the goal of demonstrating portable and completely independent communications. The public and the news media are invited to observe and participate in the radio exercise. During an emergency, normal lines of communications can fail leaving amateur radio communications as the only means to communicate. In addition, they support public events such as the Surf City Marathon and the 4th of July Parade, and participate in the National Weather Service weather spotter program. Ham radio is a public service as well as an international educational technical hobby. Whether it’s contacting someone across the street or across the globe, or even outer space, ham radio operators are ready to supply reliable communications when normal lines fail. Ham operators range from ordinary citizens to astronauts. 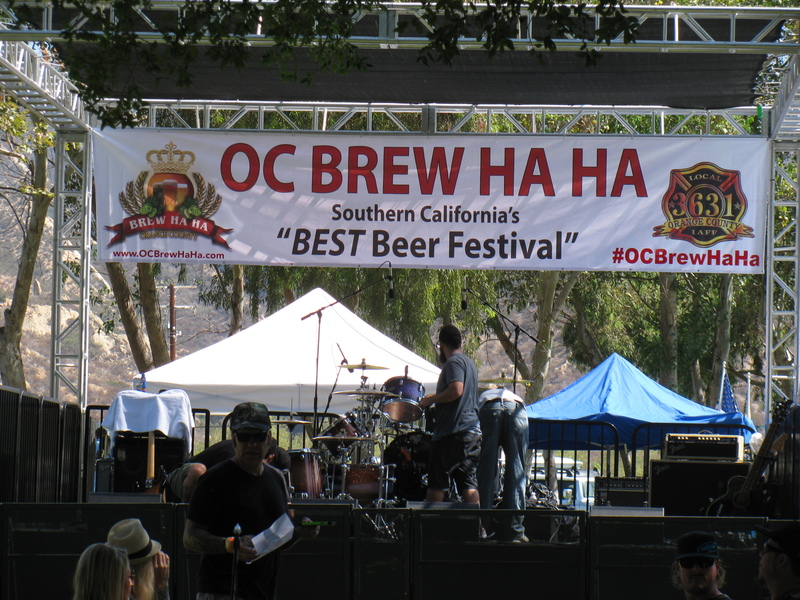 There are 18 city RACES groups within Orange County, operated under their respective city and county public safety departments. Maker Faire Bay Area is now history. 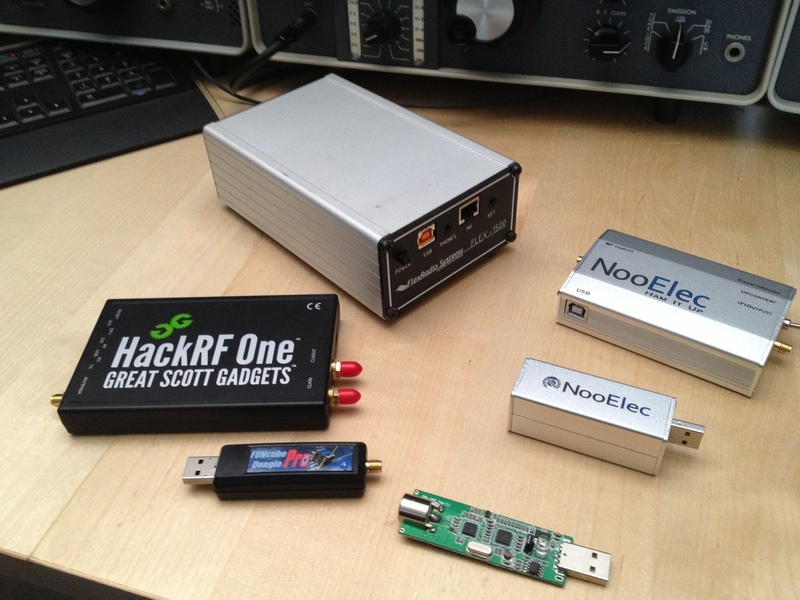 Our booth, “Not Your Grandpa’s Ham Radio” included new projects and demonstrations. 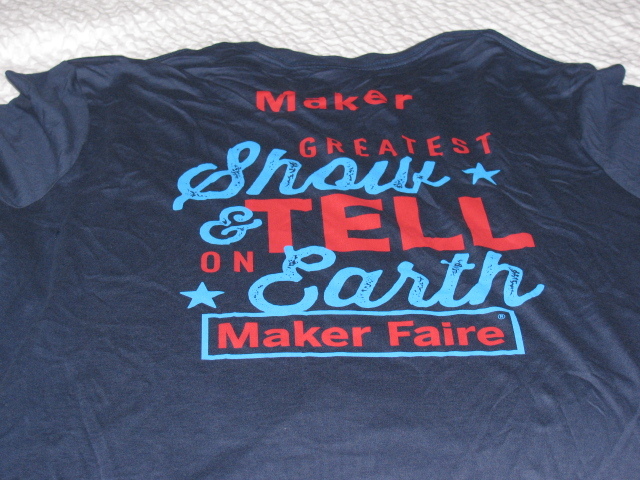 This was our fourth year as Makers and the fifth year as visitors to the Maker Faire in San Mateo. This is a short overview of our display. Stay tuned for more images, stories and videos. 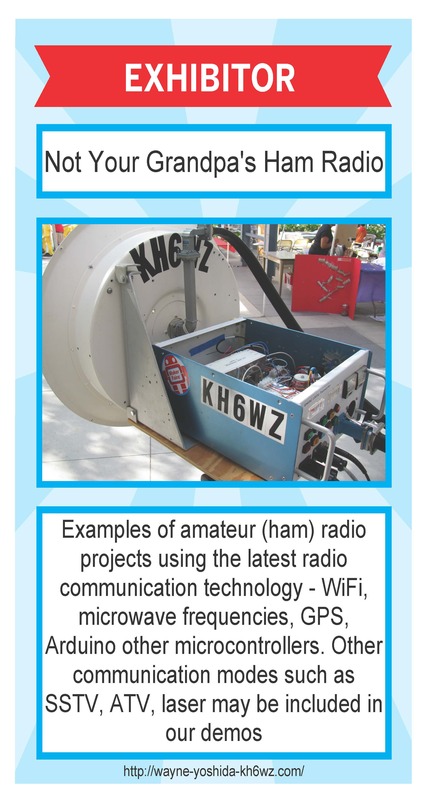 Thank you for your interest in our Maker Faire display “Not Your Grandpa’s Ham Radio.” This is our fourth consecutive year as “Makers,” and our goal is to show people what today’s ham radio operators are doing with the newest technology. We are licensed Amateur radio operators (“hams”). Yes and no. 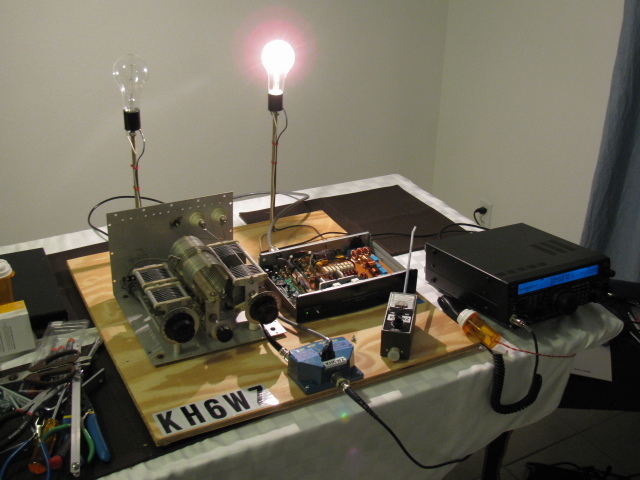 Ham radio is similar in that we use two-way radios and antennas to talk with each other, but hams can communicate using Morse code and computers in addition to voice, and we even have our own satellites. Ham radio requires a license issued by the Federal Communications Commission (FCC) in the US and licensees are required to pass a written test on electronics theory, radio regulations and operating procedures. We can communicate with other ham stations around the corner or across the globe, depending on a variety of factors that affect the way radio waves travel. 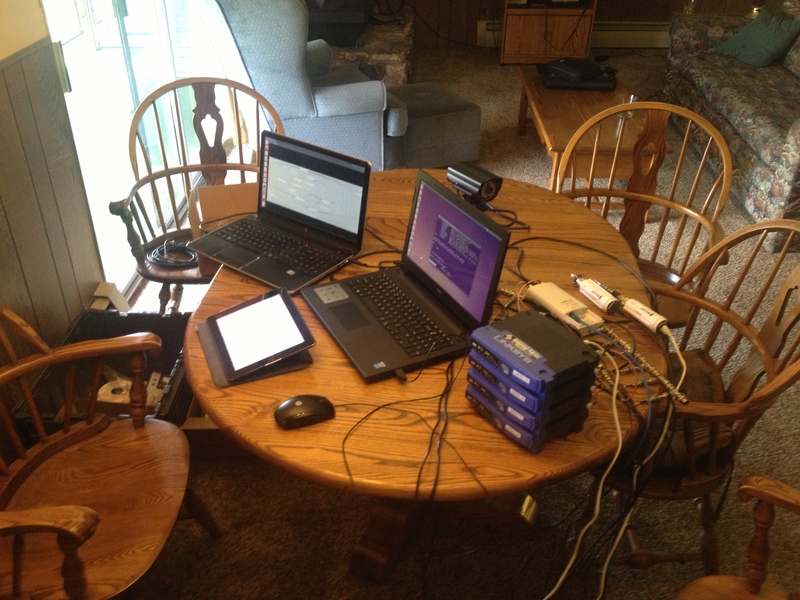 The equipment we are using operates on frequencies that generally follow line-of-sight paths. 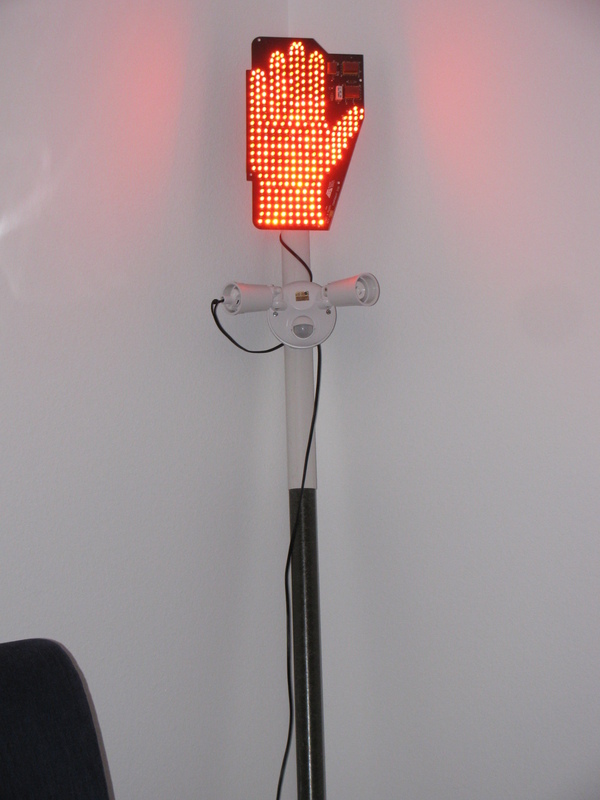 However, hams have discovered that signals can be reflected against objects such as buildings, trees, islands and mountains to extend the range. Using these techniques, we are able to contact other stations hundreds of miles away. 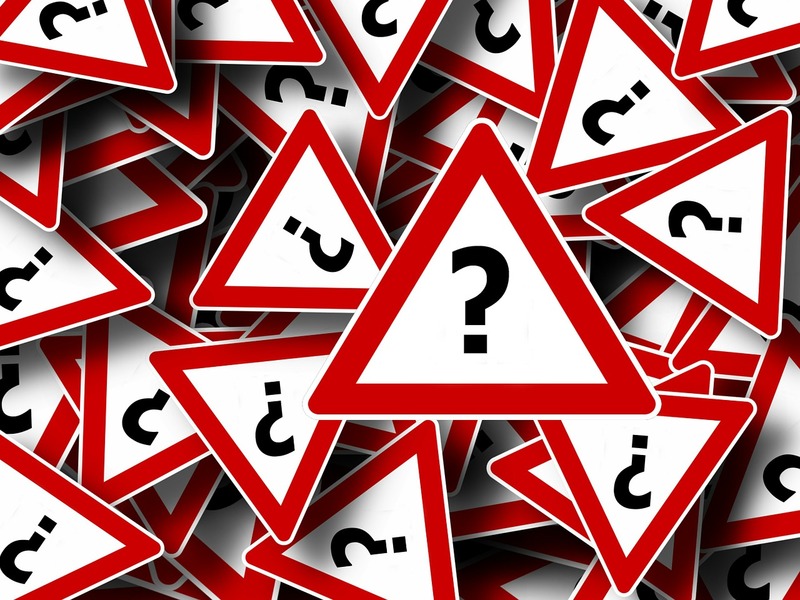 What kind of radios are you using? 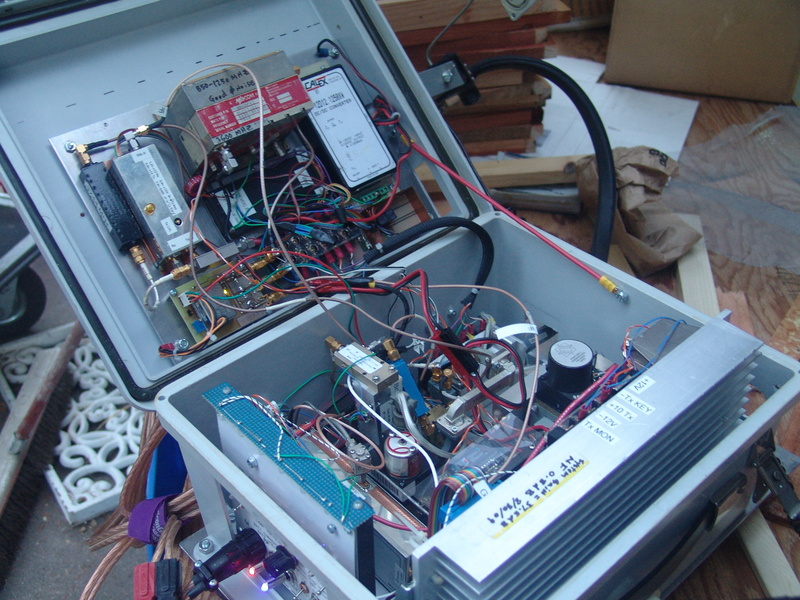 We are builders and experimenters in microwave radio communications. No commercially-built, “off-the-shelf” equipment for these frequencies exists, so we must build our own equipment, or modify commercially-made equipment meant for other communications services, such as satellite TV, cell phone and long-distance telephone. Like any other hobby, people spend as much or as little as they can afford. Most people involved in ham radio spend as much as any serious stereo enthusiast, amateur photographer or woodworker.